We’d love your help. 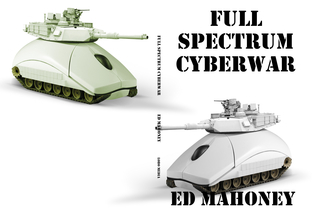 Let us know what’s wrong with this preview of Full Spectrum Cyberwar by Ed Mahoney. A year after Cyber War I made Robert Warner a celebrity in his field of cybersecurity forensics, he’s ready to cash it all in and retire young, with the sale of his software firm to a conglomerate for over $100 million. He’s two weeks away from starting the next chapter of his life living large in a Colorado resort community. He just has one more business trip to complete, A year after Cyber War I made Robert Warner a celebrity in his field of cybersecurity forensics, he’s ready to cash it all in and retire young, with the sale of his software firm to a conglomerate for over $100 million. He’s two weeks away from starting the next chapter of his life living large in a Colorado resort community. He just has one more business trip to complete, an international assignment to pen test a wind farm in the North Sea. Rob turns over one too many stones and finds himself the target of Fancy Bear, the infamous Russian military hacking organization. It’s Rob’s nature to dig deeper, to solve the crime. Instead, he’s forced to play defense, to protect the welfare of his employees, and himself. If he can survive a chase through Europe, he can complete the transaction to sell his software firm and retire wealthy. Published March 20th 2019 by Lobo Media Ltd.
To ask other readers questions about Full Spectrum Cyberwar, please sign up. An engaging story that had me reading well past my normal sleep time. Sara adds a sense of humanity and a refreshing interest to the story. After highlighting to the author, the first book in this series seemed very technical, more like a text book, Ed, obviously worked to keep the technical components to a comfortable minimum. The story stretched outside the USA into Europe and then back to the USA. It was a great read! Reading probably saved my life. Fatherless at a young age, I wasn't doing well in school. I read the entire Hardy Boys series in 4th grade and my Iowa Basic Skills score jumped from border-line retarded to above average. Been reading ever since. I mix genres, fiction and non-fiction. I even like to read product manuals and user guides. Coincidentally, writing has been a large part of my career. Mo Reading probably saved my life. Fatherless at a young age, I wasn't doing well in school. I read the entire Hardy Boys series in 4th grade and my Iowa Basic Skills score jumped from border-line retarded to above average. Been reading ever since. I mix genres, fiction and non-fiction. I even like to read product manuals and user guides. Coincidentally, writing has been a large part of my career. Mostly technical and marketing type writing, but it's all good.